It's the most wonderful time of the year! Flushed cheeks from playing outside, warm twinkly lights everywhere, warm cider and hot cocoa and cold-nosed shop dog kisses, and, of course, our favorite ritual: wrapping all of our Foundry brown paper packages, tying them up with string, and nestling them under the tree. It always makes our hearts feel sparkly and full and grateful. To capture that feeling, our wrapping party always has a soundtrack. Charlie Brown is usually our go to, occasionally Bing is more our speed, and what can we say? Sometimes we're really feeling Mariah. If it feels right, do it. 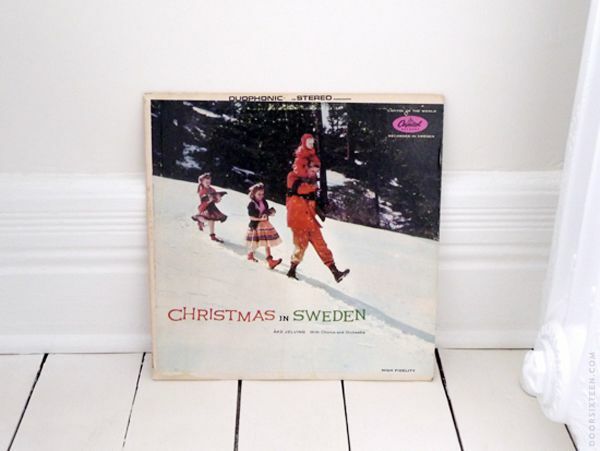 This year, though, we've found a magical treasure of Vintage Swedish Christmas Music courtesy of Anna over at Door Sixteen. The 1962 recording, Christmas in Sweden, by Åke Jelving and a charmingly enthusiastic chorus of parents and children, is simply the exact right thing for celebrating the season. If you need us we'll be surrounded by beeswax candles, sipping some mulled wine, and counting our blessings (with Åke Jelving in the background) all the way through the winter solstice. Hi Vicki! We don't have any leads but if you find the album, be sure to let us know! It's a good one! Can you buy this Swedish music?? I would love to do so!